Are you having a party and want to make something adorable that will be loved by everyone? Well, these ladybug pretzels are so easy to make that you can make it at the last moment and still get the appreciations for making such a wonderful treat! You will only need a few ingredients to make these ladybug pretzels. This would be more interesting if you are making them for a child’s birthday party where the theme is animal shaped foods and you can totally score with these ladybug pretzels. They are easy to make and no one can stop having more after having one of them so it would be better to make extra lot so that you can get some of it. 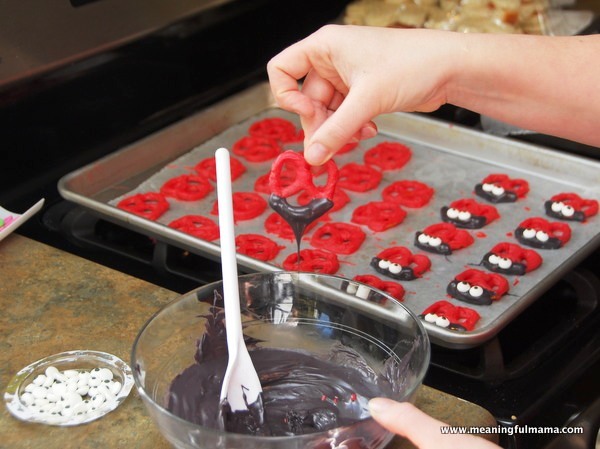 To make these ladybug pretzels, you are going to need pretzels, candy melts and a black food coloring marker. You can make the pretzels at home if you are looking for the best results but buying some from your nearest stores will also do the work. You can try making them on ready-made pretzels at first and if you think you are going to make them again, you can always try to make the pretzels at home by yourself. To start with making these adorable treats, you will need a flat surface to work on. 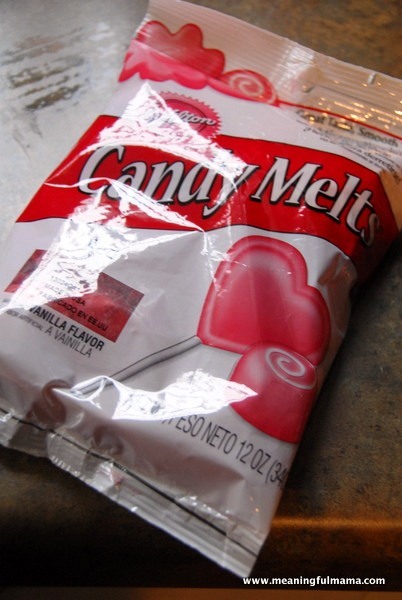 Next, you have to work on the candy melts to melt them by following the package instructions. There are different ways to melt them but the easiest one you can find is the one with the microwave. You will need one red and another black bag of candy melts. The red one will be needed to cover the whole pretzel and the black one is to indicate the head. Now get a microwave safe bowl and pour the red candy melts into it. Microwave it for a minute and check how much it has melted and use a spoon to stir the melted portion. Continue these steps until it melts completely. Now gather all the pretzels and prepare a wax paper on a jelly roll pan so that you can place the pretzels on it when they will get covered with the candy melts. 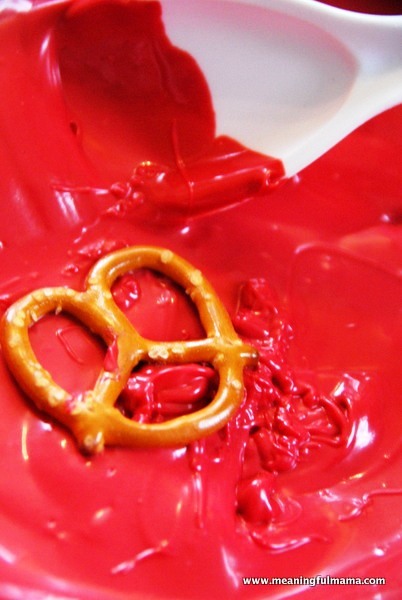 Now dip each pretzel into the red candy melts and spoon over it so the whole piece is getting covered. Pick the pretzel up from the bowl and let the excess drip to fall back into the bowl. If the holes are filled with the chocolate then put your fingers or a small spoon through the holes. 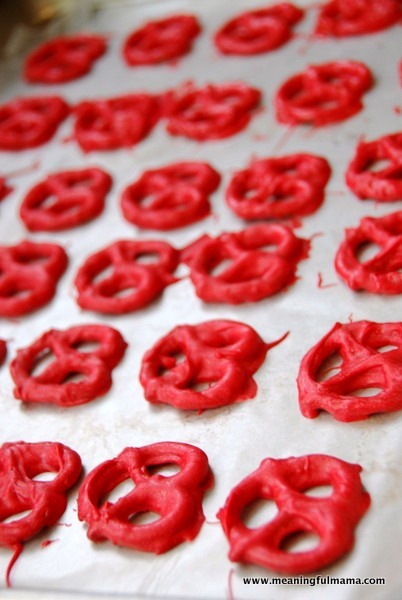 Place each pretzel on the wax paper after getting them covered with this red candy melt. After you have dipped all the pretzels, now refrigerate them so that the candy melt can get hard. This will not take much time and in the mean time, prepare the black candy melt to add the head of each ladybug. Now dip only the tip of each pretzel and place them back to the wax paper. Add candy eyes before the black chocolate gets hard. You can use the black candy melt or the black food coloring marker to put the spots on their body’s and the eyes. You can also apply these polka dots by using a squeeze bottle if you can’t manage a black food coloring marker. Refrigerate them for few more minutes and your ladybug pretzels are ready to eat!